The show centering around Sheldon (and, thus, Jim Parsons' acting prowess) gets annoying. It's like when Saved by the Bell would be so Zach-centric that the other characters spent episodes with hardly a mention. Both are ensemble shows, and with a larger ensemble on this comedy as time goes on, it's better not to focus on the same character episode after episode. 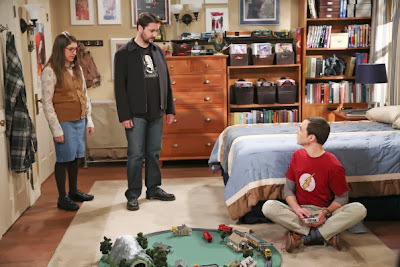 Granted, in the Christmas episode, Sheldon was used more as a plot device to offer the other characters and viewers alike a chance to look at what could have been, but I'd still prefer more focus on the others, and more interaction with Sheldon that the usual Leonard, Amy, and maybe Penny. Why couldn't Howard or Raj do something with Sheldon once in a while? Michael Yarish/Warner Bros. Entertainment Inc. © 2013 WBEI. All rights reserved.